Isamu Noguchi was a designer, child of a Japanese father and American mother who were both recognised as artists in their own countries. He was born in Los Angeles in 1904 and studied at Columbia University before attending the Leonardo da Vinci Art School. A specialist in sculpture, he later moved towards design. Through travelling, he broadened his experience and knowledge of a wide range of forms. His Tables represent some of his most well known works. Isamu Noguchi invented two tables to perfectly reflect his inspirations. The first of these was the Coffee Table, which is given its originality through extreme aesthetics. It resembles a biomorphic sculpture. 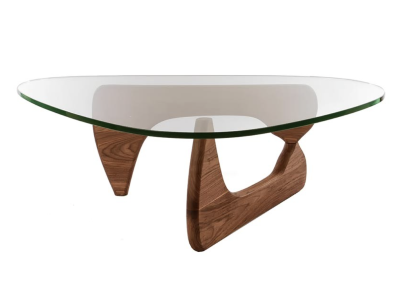 There is a 19mm glass table and two legs made of either black ash, walnut or maple; both of which display their curves to the full. The second table is the Cyclone, designed in 1953 to look vaguely like a stool. It has a circular table in black metal and chrome legs in the shape of a tornado. These legs entangle to support the tabletop. Isamu Noguchi could proudly state that the Coffee Table is his most successful creation and that the Cyclone is also incredibly radical and original. The Coffee Table in particular can be adapted to any interior with its mix of modernism and rationalism.